Vista Sol Buenos Aires is in the heart of Buenos Aires, walking distance from Galerias Pacifico and Sociedad Rural Argentina. 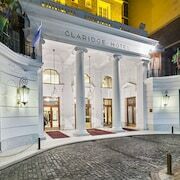 This 4-star hotel is close to Obelisco and Teatro Colon. Make yourself at home in one of the 83 air-conditioned rooms featuring minibars and LCD televisions. Complimentary wired and wireless Internet access keeps you connected, and cable programming provides entertainment. Conveniences include safes and desks, and housekeeping is provided daily. Featured amenities include complimentary wired Internet access, a computer station, and dry cleaning/laundry services. Planning an event in Buenos Aires? This hotel has facilities measuring 258 square feet (24 square meters), including meeting rooms.